This version of WhatsApp became obsolete on 24-December-2015. Please go to Google Play Store to download the latest version. Your device's date is 26-December-2015. If this is incorrect please correct your device's date settings then restart WhatsApp. Are you also facing the same problem and want a counter solution for this? Simply click the download button available at the bottom of screen. This will redirect you to the Google Play or Apple Store from where you can download the latest version. If you don't have enough internet data to download it and want instant access to your messages then you can still use the obsolete version. But how? This is what I am going to discuss today. So lets begin this tutorial now. Now scroll down and click "Date & time". 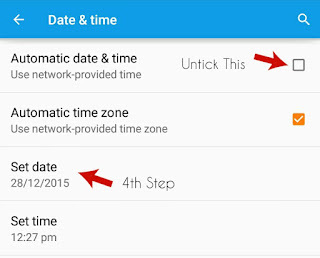 Here you'll find "Automatic date & time" option. Check whether it is turned ON or OFF. If it is ON, un-tick the button next to it to turn it OFF. After this, you can make manual changes as per your choice. From same window, click "Set date" option and a pop-up box will appear. Select any date you want and click "OK" button. Now restart your phone and open WhatsApp. Boom! You have done it. Enjoy using your outdated version. How to choose perfect date? 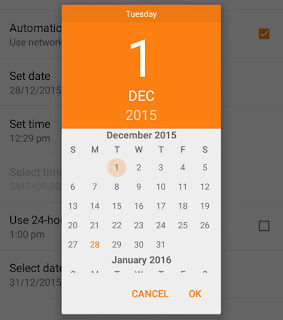 Choose any date before the day your WhatsApp version became obsolete. In my case, I can choose anyone before 24-December-2015. Keep 1 week to 1 month difference between the date you choose and the day your app version became outdated. Change year or month only if necessary. If you'll make large differences, WhatsApp will display a message showing that your system date is incorrect. So keep this thing in your mind. Finally, if your app version expires on 24-December-2015, you can change your system date to 1-December-2015 which is a perfect choice. It's obvious that changing system settings will affect other applications data also due to which some of the apps may not work properly or misbehave. This is the main disadvantage of using this trick. Attackers might be trying to steal your information from www.google.co.in (for example, passwords, messages, or credit cards). When I visited few more HTTPS enabled sites, same message is displayed and I concluded that it is due to the expiration of SSL certificate. Speaking frankly, I don't know technical part here but to rectify this problem I just changed my date and again it starts working as normal. In the same way, If you also face similar problems after using this trick, please undo all changes and instead of this, download the latest version of WhatsApp. Don't choose simplest path always. Learn new things and try it in a different way. Just give a one try to this and enjoy using WhatsApp in outdated version. This trick is applicable on all major platforms ( i.e., on Android, Windows or iOS) . Finally If you've any questions or doubt regarding this topic, please let me know in below comment box. Is there any other way you know? Love and Blessings ! Bhai my WhatsApp keeps saying version expired and even after I changed the date it said so. What do I do? Well, I am Anna and I have been using whatsapp since september of this year. when I had bought my new phone it had an obselete version of whatsapp dating to july 22nd of this year. then i had updated it 3 times before the gif and video caliing updates came on 24th of november. i was very excited about video calling so i tried to update my whatsapp but due to insuffient storage i was not able to do that. when i cleared all cache and data it shoed me an error saying " google talk authentication failed". i tried to find solution over the net and following the suggestions i removed my google acoount from my android for which i had to reset my phone to factory set. when my phone restartted i found that the whatsapp version is obselete and it dates back to july 22nd of this year. and now it is 26th of november. so even if i change the date there is always a huge difference which can be recognized by whatsapp and it asks me to change the date of my phone as it is inappropriate and still shows that the version is obselete. i have also tried installing apks but it does not install. and when i try to download it through google play store it says " whatsapp could not be updated due to an error(923)" and even now it shows the eroor "google talk authentication failed". what shall i do to continue using whatsapp from my device with or without updating? I completely uninstalled Whatsapp on my iPhone (version 6.1.6) and then re-installed an older version, so I am assuming my cache is clean now (I don't know which other way to clean the cache). So, then iPhone told me that I had to update my Whatsapp version (it doesn't let me use the older version). So, I changed the date, as you suggest in your text. However, now when I start up Whatsapp (after switching off/on the phone), it complains that the date is wrong and I have to change it before I can use Whatsapp. I set the date to december 2016 so I cannot change it to anything later. So, now what do I do? 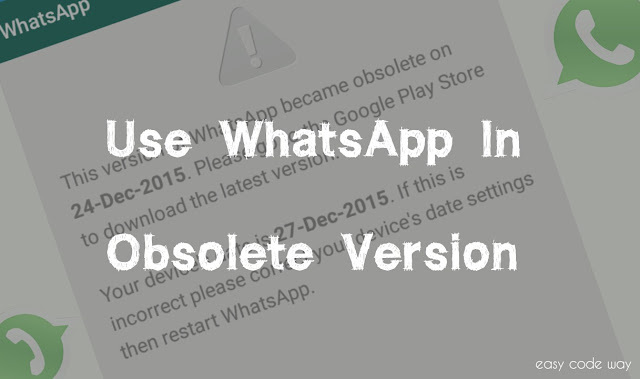 HELLO, I RECEIVED THE SAME WARNING ,"This version of WhatsApp became obsolete on 24-December-2015. Please go to Google Play Store to download the latest version." my question is, will i be able to read my unread messages cause i had 65 unread messages, and i am afraid of loosing them, so i decided to not entering whatsaap until i find out what to do, please tell me, will i loose my (unread) messages? You just saved my life! Worked beautifully!